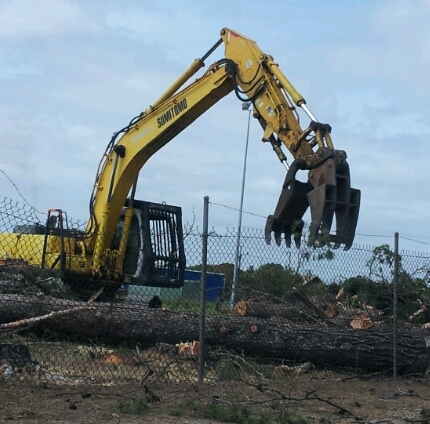 The roar of machines filled the air over the weekend as the aging trees on the McLaughlin Park border were removed due to safety concerns. Trees have already been removed on the Williams Road boundary and replaced with a mix of coloured leaf trees and the removal of the aging trees on the Plunkett Tce boundary at the weekend is a continuation of the boundary work in the upgrade of the sporting facilities. Plunkett Tce was closed for much of Sunday afternoon while a band of volunteers, sporting organisation representatives and local businesses carried out the work. Categories: Basketball, Community Groups, Football, General News, Millicent, Wattle Range | Permalink.